May 23, the first day for the newly imported interns in the Honduran UMF office. As became a common occurrence, Patrick began talking coffee even before we walked through the door. We quickly learned the importance of proper fertilization, and the massive role that we would soon play in the distribution of microloans to our clients. Within the week, we would begin calculating qualifying loan amounts for clients and processing the nearly 200 requests for loans that we received from the twenty-three aldeas surrounding La Unión. By June 1, we had approved 171 clients for a total of 1156 bags of fertilizer. Personally, I had no idea that there were nine different types of fertilizer for coffee, let alone the exact names of them. By the following week, I had become intimately familiar with all of the bags, with five of us carrying each of the one hundred pound bags off of the delivery truck and into the warehouse that would become our new center of operation for the coming two weeks. In a blur, the countless names that the four interns had become so familiar with while processing the mountain of paperwork became living, breathing, inevitably smiling (and sometimes quite entertaining) clients sitting in our office, signing paperwork and loading their yearly supply of fertilizer into their pickup trucks. We watched them drive off, trucks buckling under the weight of the fertilizer, heading out to work on the coffee that we will soon enough begin to process at our beneficio and some of which we will purchase in six short months. Thus far, UMF has exhibited a forty percent increase in microloans from 2011, with more loans still to come. It has been a whirlwind of a week for the interns, but we are looking forward to more to come! The pictures below follow the distribution process, capturing the intern experience and just some of the people and paperwork (there was a lot) involved. Fertilizer loading and unloading is an all-hands-on-deck sort of process. Between the UMF staff, interns Ben and Dillon, and occasional paid hands at the rented warehouse, 1156 bags of fertilizer were unloaded from the semi-trucks and stacked in the warehouse. A certain rhythm developed, as one person would help the other flip the bag onto his back. Lennie and Natalie kept busy documenting the process with pictures and keeping count of inventory. After plenty of sweat, dirt, and an injury or two, the bodega (a warehouse) was filled. Seeing so many stacks of bags and knowing that each would have to be distributed and accounted for impressed upon us all the immensity of the task ahead of us over the next two weeks. The first step of our fertilizer distribution process began in the office with computers and piles of paperwork. We had spent the past few weeks assembling our client’s paperwork and calculating loan approval amounts. Ben has become the master of the spreadsheets and is an integral component of the process, checking each farmer’s order request and qualified loan amounts against our inventory totals. After checking totals on the computer, there is (of course) more paperwork. A libreta (a small booklet) is filled out for each client documenting this loan of fertilizer. The clients then bring their libretas with them to each loan meeting in order to track repayments and attendance through the twenty-three meetings over the next ten months. For those clients who are unable to sign their names, a fingerprint functions in its place. Literacy is an issue in many of the aldeas, with the average education level of our clients being completion of the third grade. Here the client displays his ID, presses a finger to the ink, and signs the paperwork via fingerprint. With paperwork complete, albeit temporarily, our clients pocket their libretas and drive their trucks across the street to the front door of our bodega where the fertilizer bags are stored. We take security seriously here in La Unión. The bodega is guarded by a huge, terrifying dog constrained by a thick chain during the day. There was a funny moment the first morning as Gilberto, one of UMF’s Honduran employees, growled and grabbed Lennie’s ankle. She screamed and jumped a foot. One thing is certain, nothing is getting past that dog. Martir, one of UMF’s Field Officers, seems to be everywhere at once throughout the distribution process. 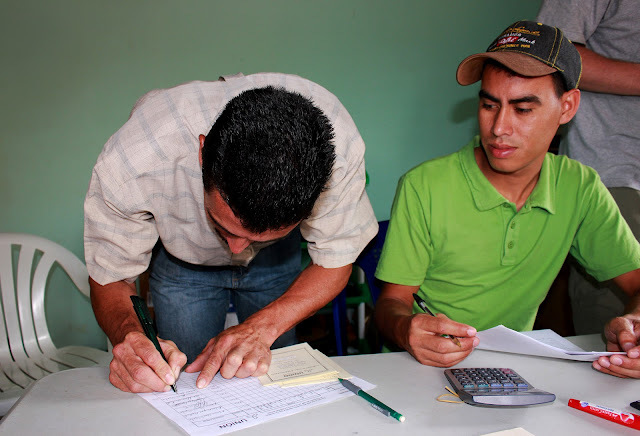 Martir, Gilberto, and Pedro alternate helping to fill out loan paperwork with clients in the office, checking orders with them in the bodega, helping load fertilizer into trucks, and keeping tabs on our inventory totals. Here, Martir balances amidst the fertilizer stacks, recalculating inventory amounts. 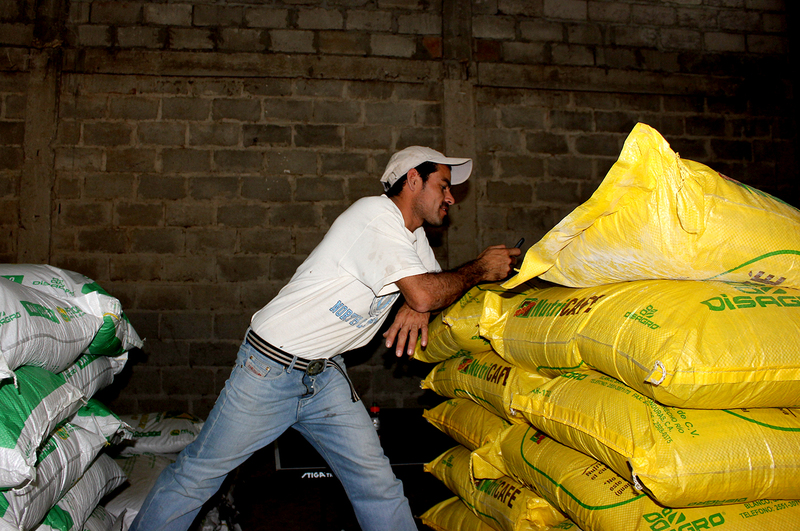 Reinaldo Mejia Hernandez, a fist year client from Gualciras, displays his libreta as his fertilizer order is loaded. Clients use their libretas to confirm their numbers with our paperwork, ensuring that they receive the appropriate type and quantity of fertilizer. 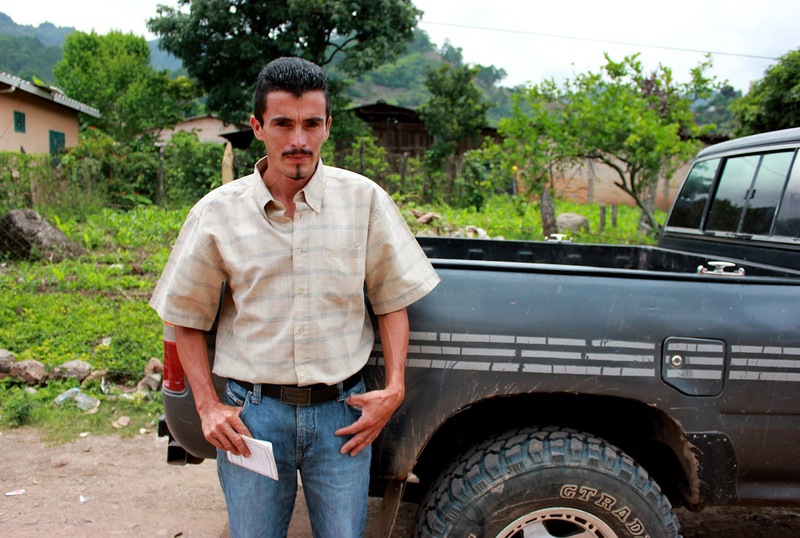 Pedro Mejia, a prominent second year client and coffee producer from Gualciras, carries one of his bags of fertilizer to his truck. Everyone lends a hand loading fertilizer for the clients, as Natalie keeps track of inventory sheets, checking that the fertilizer leaving the bodega matches what is listed. After the fertilizer is loaded, Natalie confirms the fertilizer totals with each farmer, assuring that they receive exactly what was ordered, and finally the farmer signs to mark the order complete. Angel Hernandez, a second year client from Gualciras, puts on the finishing touches, packing down his fertilizer as he prepares to depart. 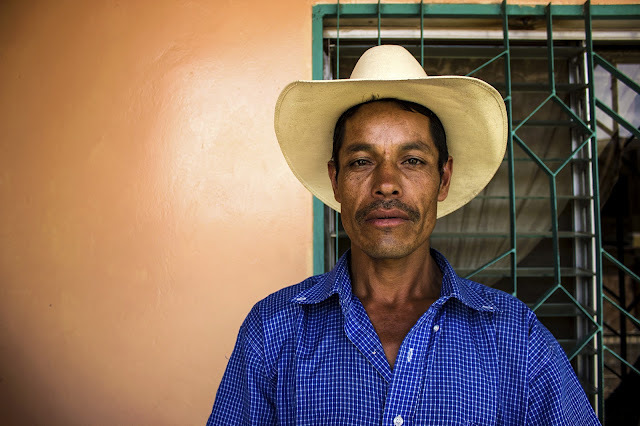 With many a “que le vaya bien,” we wished him well on his way and watched as he drove off down the dusty dirt roads with a truck full of fertilizer and full of energy and enthusiasm for his coffee harvest. This is my first time spending an extended period of time in a developing country, and I’d be lying if I said that life isn’t that different. There have been a lot of changes to adjust to, yet despite some of the challenges, it’s been well worth it for the amazing experience, the people I’ve met, and the many things I’ve learned already. We were picked up at the San Pedro Sula airport by Jeremy Miller, UMF’s Director of Honduran Operations, and Albin, our head of security, a Honduran man who we soon learned was both incredibly tough and very kind. During our three hour drive to La Unión, careening across lanes and maneuvering the hilly, potholed dirt roads with ease, he showed us pictures of his three children, the pride and love evident in his voice. Though the roads became worse the further we drove, the scenery and mountain views became more and more spectacular. In town the roads are all dirt (and, after a rain storm, all mud) and filled with holes and rocks. Walking down the street is always a challenge to find the least muddy route and to avoid the dogs, chickens, horses, motorcycles, trucks, and other passerby that are always traveling every which way. The houses are small and pretty, painted in bright shades of pink, yellow, and aqua. There are lots of flowering trees, and, of course, the constant views of the beautiful verdant mountains surrounding the village. I quickly learned to consider it a luxury rather than a fact of life to have both water and electricity at any given time. During my first week, there was one night when the water ran out mid-shower, and then the next night the power went out, leaving the shower pitch black. We learned to judge the usability of the water by whether washing with it would leave us cleaner or dirtier than we were before bathing. Cold showers are perfectly acceptable here, the question being whether our temperature choice would be icy, cold, cool, or, once in a while, lukewarm. Food too is always an adventure. At the airport I had my first baleada, a classic Honduran meal consisting of a tortilla filled with a combination of eggs, beans, cheese, avocado, and mantequilla (a mayonnaise-like sauce). It was really tasty, though baleadas were much less exciting when they became the standard daily lunch. At our local comedor (a small eatery), I eat a baleada for 10 lempira, the equivalent of a 50 cent lunch. Liquados are among my favorite food finds. Similar to the consistency of a frappacino, liquados are blended drinks made with ice, fresh milk, and whatever fruit is available, pineapple and watermelon are common at the present. I love being able to buy peeled and halved oranges at the fruit stand on the corner, and it’s become a part of my daily routine. There have been many changes to adjust to living in La Unión, but as we enter our third week here, I feel comfortable and at ease. 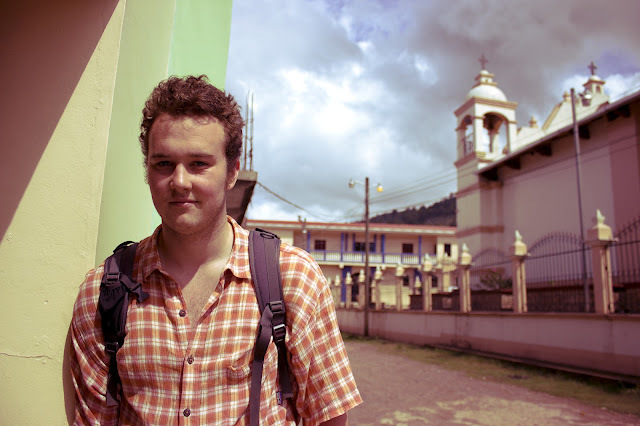 Ben, Lennie, Dillon and I keep busy researching and assisting the Unión MicroFinanza staff and have enjoyed exploring the town, chatting with locals, and playing cards together in our free time. These first couple weeks have been great, and I am eager to learn more, continue to absorb the culture, and maximize the experience.